Today, Sunday, 8 November 2015 is Remembrance Sunday in the United Kingdom and the Commonwealth. It is a day ‘to commemorate the contribution of British and Commonwealth military and civilian servicemen and women in the two World Wars and later conflicts’. Over the years, several contributors to Hear The Boat Sing have written about oarsmen who have died in war and the tag ‘war memorials’ will bring up many of these posts, each one different, all of them moving. While all these deaths are tragic, the poignancy seems to be increased (if that is possible) when the fallen are little more than boys. 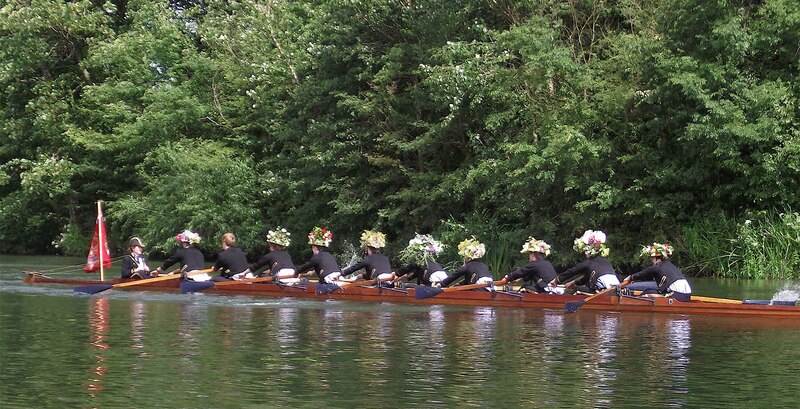 Those who attended the ‘Procession of Boats’ at the ‘Fourth of June’ celebrations at Eton College last May had a stirring reminder of some young rowers who, between 1914 and 1918, went straight from school to war, many to die before their teenage years ended. Eton College (actually a school for boys aged 13 to 18) is arguably the most famous fee-paying school in the world. Sited just over the river from Windsor, it was established by Henry VI in 1440 and has educated, amongst others, nineteen British Prime Ministers. 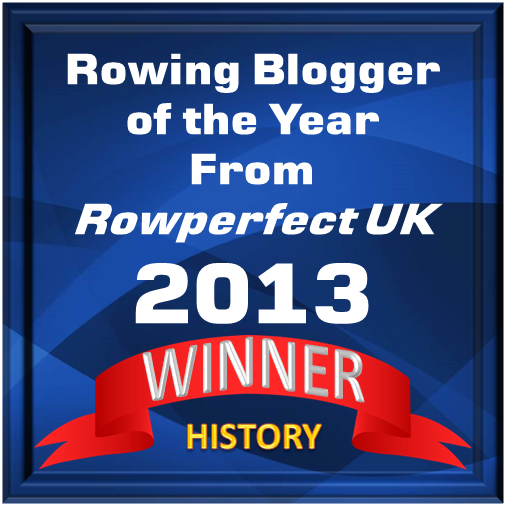 It also has a claim that it invented rowing as an amateur sport and its boys were certainly boating in the 1790s, if not before. The ‘Fourth of June’ is the birthday of Eton’s greatest patron, King George III (1738-1820), and is the school’s equivalent of parents’ day or open day. In modern times, it is actually held at the end of May. There are exhibitions, speeches, sporting events and, most famously, the Procession of Boats. I attended the 2011 Procession and my report on that memorable occasion is here. Part of the 2011 Procession of Boats. The boat Victory is on the right, the boat Monarch is on the left. The Procession of Boats is a ‘row past’ in front of the parents and the masters assembled in one of the school fields that rolls down to the Thames. It starts with the most senior boys’ boats and ends with the youngest. This does not sound particularly special – but there are several ‘Etonian Twists’. Firstly, the boats are mostly Victorian, all fixed seat, most with ‘fixed pin’ gates (i.e. no swivel rowlocks) and the leading boat is a ‘ten-oar’. The oars have ‘needle’ spoons and, naturally, boats and blades are all made from wood. The next oddity is that the rowers are dressed in the uniform of eighteenth-century midshipmen, with the cox dressed as an admiral or other senior naval officer. 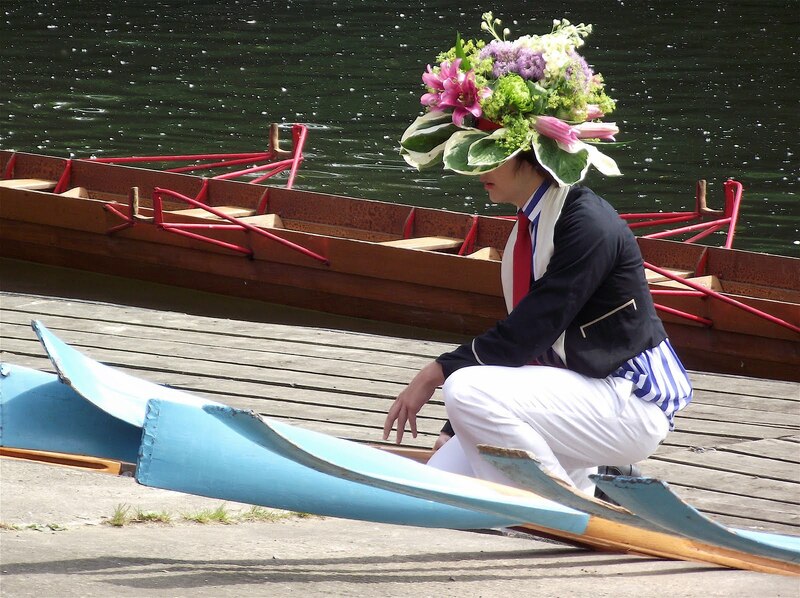 Most strikingly, the oarsmen wear straw boaters extravagantly decorated with fresh flowers. Finally, at a certain point in the row past, each boat stops in turn and the entire crew and the cox stand up. Those in boats with open fixed pin gates then hold their oars erect. This is not easy, but they are assisted by the fact that Victorian eights are more stable than modern racing boats. They then face Windsor Castle, remove their hats and cheer the Queen and the memory of George III, shaking the flowers from their boaters into the water. The crew then resume their seats and row off out of sight. Film evidence from 1938 of these unlikely happenings is on the ever reliable Pathé Newsreel site here. This lad’s ‘Dame’ (the matron who looks after the health and welfare of his ‘house’ of 50 boys) has done a particularly good job of decorating his boater. The picture also shows the needle blades used and the boat’s fixed seats and the non-swivel ‘fixed pin’ gates. 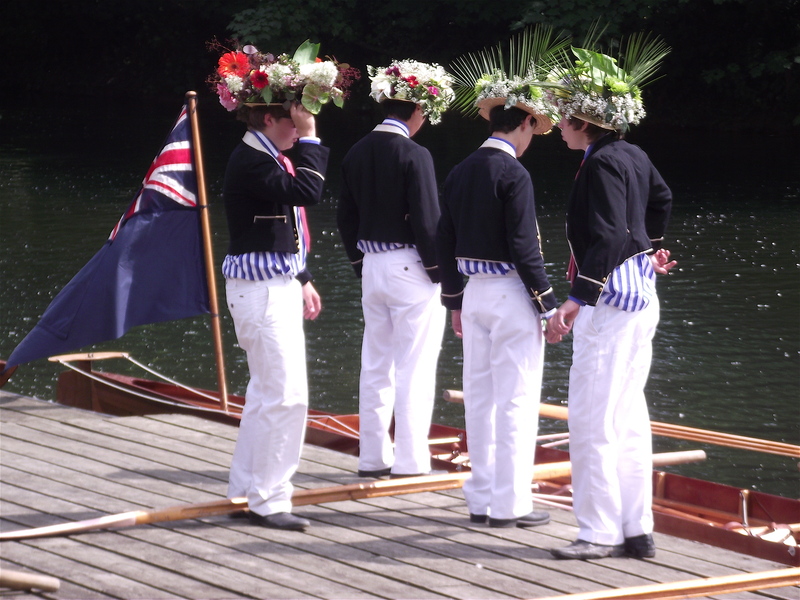 The order of the Procession of Boats reflects the way that rowing at Eton is organised. Seventeen- and eighteen-year-olds row in ‘Upper Boats’. They are led by Monarch, the ten-oar stroked by the Captain of Boats who, historically at least, invites the Captain of the First XI cricket team to join in the row. Monarch is followed by Victory (First VIII), Prince of Wales (2nd VIII) and Britannia (3rd VIII). Sixteen- and seventeen-year-olds are called ‘Colts’ and they follow behind the Upper Boats in Thetis, Hibernia and St George. Finally, fifteen-year-olds are called ‘Junior Colts’ and they bring up the rear in Alexandra, Defiance and Dreadnought. 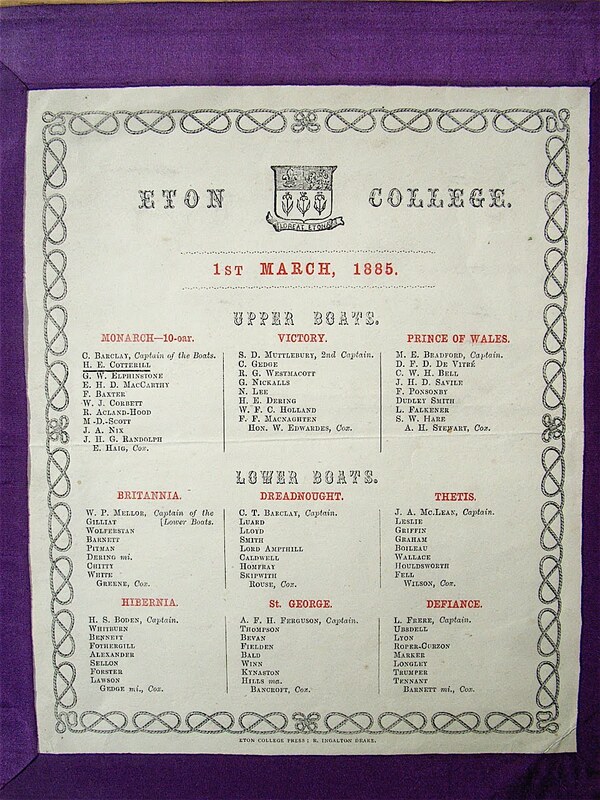 The 1885 programme for the Procession of Boats. The modern one is very similar. 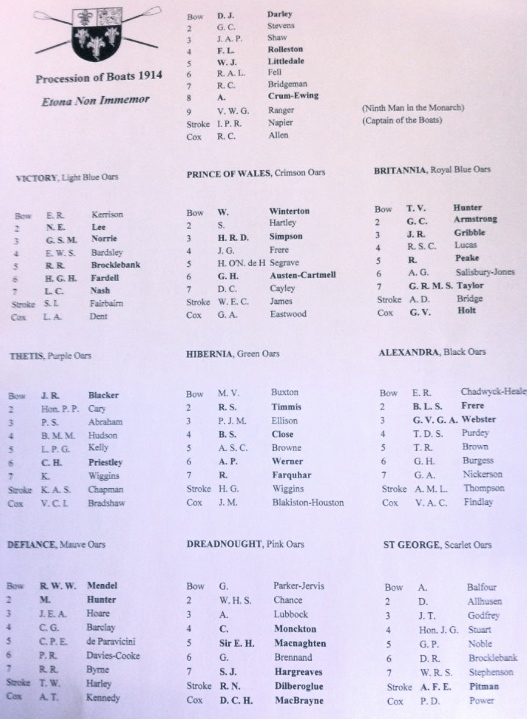 For the 2014 Procession of Boats, the intention was to include with that year’s printed programme, a copy of the 1914 programme with the names of the boys who were killed in the First World War highlighted in bold. Unfortunately, the 2014 row past had to be cancelled because of unsafe water conditions so this was eventually done for the 2015 Procession. The 2015 version of the 1914 programme. This is a poor picture (click to enlarge) but it is possible to make out the names in bold indicating those that died in the war. Of the 92 boys named, 34, over a third, were killed. While the loss of a young man educated at Eton is no greater and no lesser a tragedy than the death of someone from an ordinary background, it is ironic that the First World War was one of the very few times when the privileged position enjoyed by young men from public (which in Britain means ‘private’) schools was actually detrimental to them. The young gentlemen from Eton and the Edwardian public schools paid a terrible price for (their sense of) duty. It was a funny old world war, the First World War, but there was one unassailable, and surprising, truth about it. The more exclusive your education, the more likely you were to die. As a rule of thumb 20 percent of public school boys who fought in the war died, against 13 per cent of those overall who served…… Historians have a horrible phrase for this difference between the war’s general mortality rate and the public school rate: “surplus deaths”. The reason for the “surplus deaths” of public school boys is simple: They were more likely to be junior officers, lieutenants and captains…… By the rule of the British Army, junior officers were the first “over the top” and the last to retreat. Lewis-Stempel says that the two most junior officer ranks often suffered a casualty rate twice that of private soldiers and that their average life expectancy on the front line was six weeks. At one time on the Western Front, officer deaths were one in seven and officer casualties were one in two. Of course, public school boys were easier for the Germans and Turks to hit. Due to their better diet and general physical fitness they were, on average, five inches taller than their working-class contemporaries in 1914. As the war went on, the ‘officer class’ was rapidly decimated and by 1917 ‘temporary gentlemen’ from middle and working class backgrounds had to be recruited to fill the void. The Britannia crew of 2011. Six of the 1914 crew were killed. The ten-oared Monarch of 2011. Four of the 1914 crew were killed. Some of the 2011 Dreadnought crew. Five of the 1914 crew were killed. The public schools would be the last bastion of the volunteering impulse. Long after the desire to freely serve had departed the rest of Britain, boys from the public schools carried on queuing for commissions. In Autumn 1915 (no one from the public school, Winchester College) went up to Oxford for the first time in 500 years. The playing-fields of Eton. Boys v Old Boys cricket match on the ‘Fourth of June’ 2011. 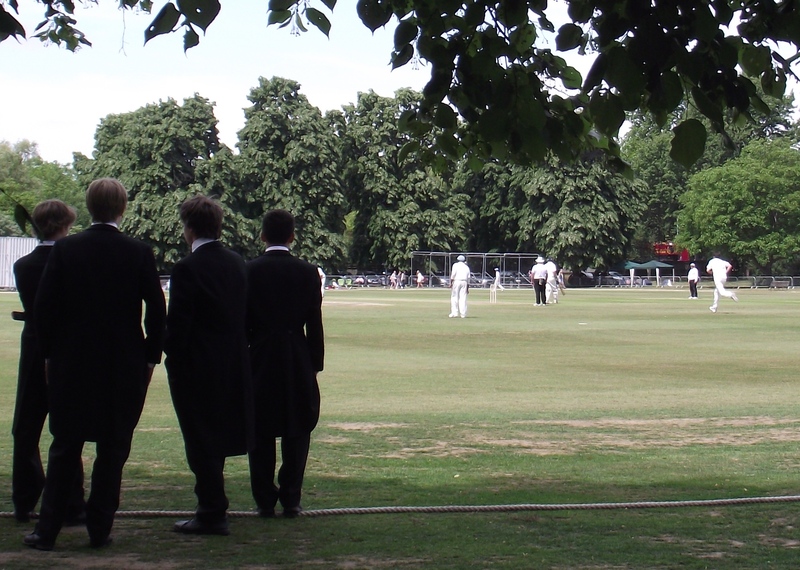 Eton summer sport is divided between the ‘Wet Bobs’ who row and the ‘Dry Bobs’ who play cricket. Legend has it that when the victor of the Battle of Waterloo, Old Etonian, the First Duke of Wellington, was visiting his sons at the school, he observed a cricket match and remarked that ‘The Battle of Waterloo was won on the playing-fields of Eton’. Some hold that he may have actually said ‘There grows the stuff that won Waterloo’ meaning that the public school stress on all sport built ‘manly character’ and was a key part in preparing the boys as incipient warriors. This idea was also encapsulated in the poem Vitae Lampada which was incredibly popular until the idea that war was some sort of extension of a game of cricket died on the Somme, if not before. Wellington’s OE great-grandson was killed in action in 1914, three months after the war started. Intraschool polo match, ‘Fourth of June’, 2011. …..the cavalry is the subject of one of the Great War myths – that they were the first love of High Command who were all cavalrymen but were an expensive waste that did nothing to help the poor footsloggers. The reality is that on the Western Front they rarely had a chance to act as a mounted mobile force but often fought dismounted as infantry. On the few occasions when they were sent into action on horseback, they often suffered appalling losses. Without them, the crucial First Battle of Ypres – and arguably the war – would probably have been lost. In Egypt and Palestine, the cavalry was the mainstay and battle-winner. 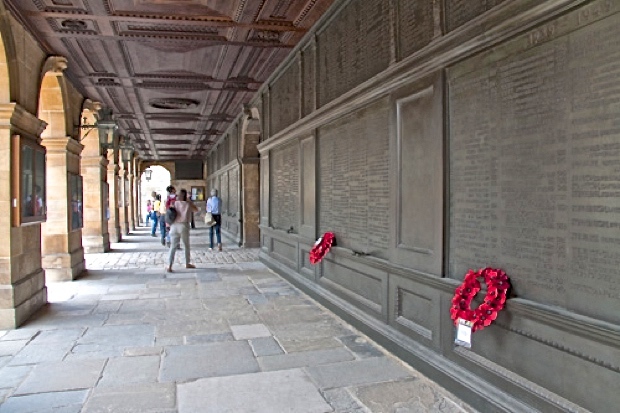 The cloister at Eton containing the school war memorials. 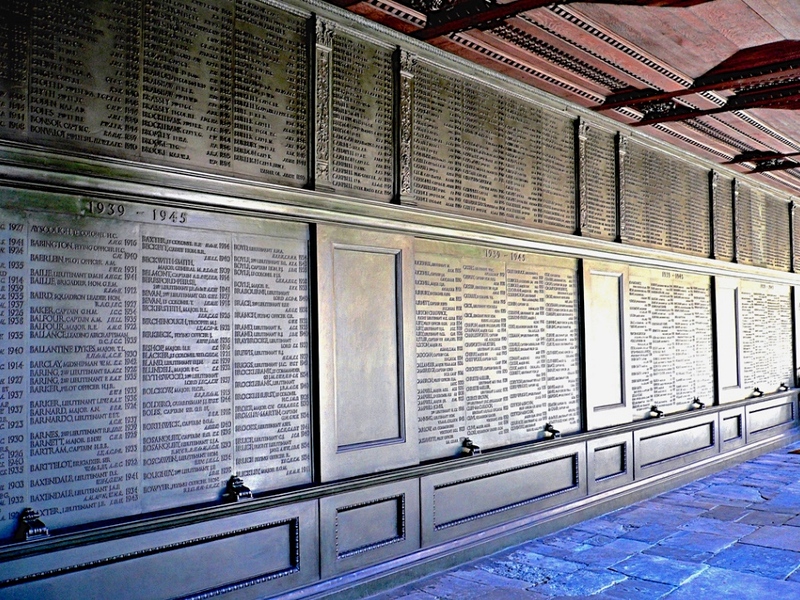 A closer view of some of the school war memorial panels. In addition to the near 1,200 OEs killed in the 1914-1918 War, 50 were lost in the Crimean War, 130 in the Boer War and 700 in the 1939-1945 War. The last casualty was in Iraq in 2003. Picture: Harry Lawford. Wonderful,article,,I really enjoyed reading it.